In the early to mid 90's we were seeing the "emo" genre take shape and many of my friends were fawning all over a band called Sunny Day Real Estate. To tell you the truth, I thought Sunny Day Real Estate was way too overproduced and boring. I thought to myself, "This would be cooler if it had more of a rawness to it, that showed flaws and desperation". Then came Mineral, who did everything Sunny Day Real Estate couldn't. "The Power of Failing" is a record that contains some of the most well executed moments in music. Mineral's use of dynamics and melodies on this record are something that I haven't heard duplicated properly or topped since. Perhaps it's the blazing, bright distortion of the guitars or the quivering vocals; Mineral manages to capture melody with a wonderful imperfection. While many bands in the "emo" genre today are using autotune and voice instruction to get every note perfect, overproducing their sound until the raw energy has been sucked out; Mineral put all those flaws on display, only to create something unique and timeless. I still remember my 16 year old self getting home and putting this on the turn table. Side A was really just one great song after another. The record starts in upbeat territory with "Five, Eight, Ten" and "Gloria". Guitars blazing away and excited drumming makes these two tracks a great way to kick things off. The band slows down, but still maintains it's urgency and power with the aptly named track, "Slower", containing some of the most emotionally self-reflective lyrics that I had ever been exposed to. "Dolorosa" brings the band to a totally subdued place with it's light drumming and drawn out vocal style. Here I am, at 33 years old, all those years later and my spine is still tingling as I listen to it. "If I Could" brings us back to that driving, but slow, sound, similar to "Slower", but every bit as beautiful. The record concludes with "Parking Lot", which combines the band's slower style to begin the song, but ends with an upbeat tempo to create an epic ending. It wasn't until later in life that I delved into the background of the band. The debate on the lyrical content seems to be a matter of interpretation. One could really take some of these songs as extremely religious in nature. There's many references to "grace" and "praise", which are seemingly pointing in the direction that these "emo" masterpieces are really an expression of the band's love for a god-like being that they seem to believe in. Were Mineral a bunch of right wing fundamentalists? Most likely not. But, they seem to be reflecting on the emotional aspects of life through a spiritual lens which could or could not sway your opinion. Regardless, I find the music and lyrics pretty timeless. The record is a beckoning to a time forgotten, when the term "emo" was not being gobbled up by the mainstream and bands weren't writing contrived songs about killing their ex-girlfriends to insecurely express their emotions. 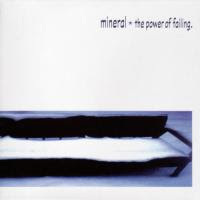 It was fleeting; you certainly can't find a band like Mineral these days and you may never see another record like "The Power of Failing" again.